Mr. Zhang ding is an outstanding revolutionary writer and art educator with great influence emerging from the education circle of China in the 20th century. Zhang ding's life is closely related to the magnificent revolutionary history of modern China and the development of art education in new China. Zhang dingdinghas 18 kinds of martial arts, which can undertake different historical missions in different historical periods, which makes his life magnificent. However, I also saw a determined and conserved zhang ding. For example, he always insisted on sketching from nature, which was also the most lasting life state of zhang ding. 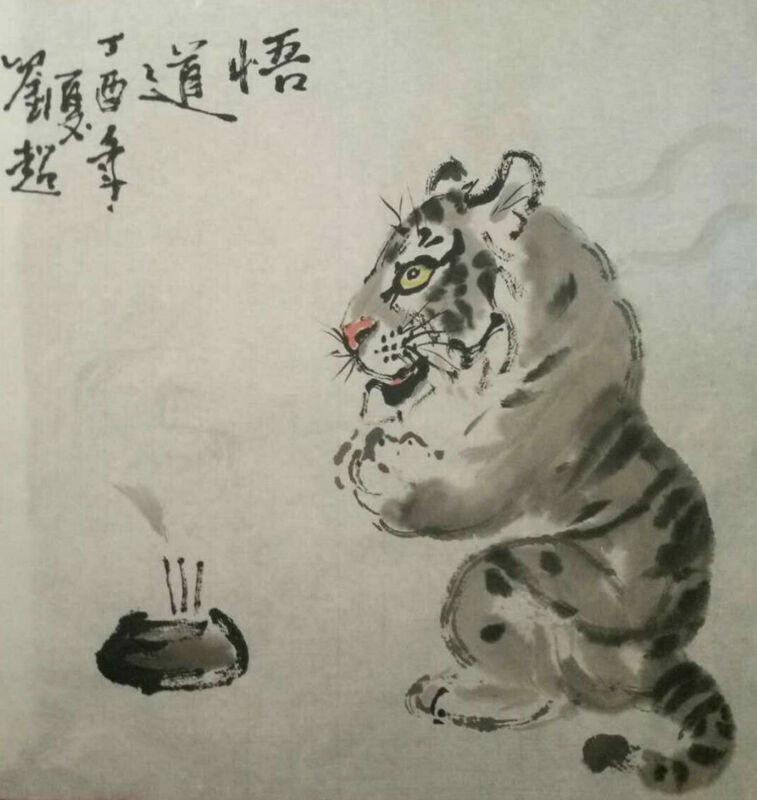 Since the late qing dynasty, Chinese painting has become problematic because of the eastward spread of western learning with an external reference frame. When kang youwei compared his western paintings, he felt that his only possession was a big sword and a long spear, but he could not compete with other people's foreign guns. For example, the four Kings said that paintings should have the style of the tang people, the song people and the yuan people. This situation is the result of the self-circulation of Chinese painting in a closed system for a long time, which is also the reason why many young people in the republic of China studied western painting in foreign countries. But then Zhang Ding, after all, there is a sense of mission and sense of responsibility, he focused on some seemingly radical ideas, these ideas at the beginning of the founding and the reform and opening period, there have been, Zhang Ding don't accept Chinese paintings allow teasing or humiliated, force or castration, as early as 1955 published stories refused nothing and keep the two rival, both to the left will anti-rightist movement. But opposition is not enough. What he thinks about is how to bring forth new things, starting from the inside of tradition and making old trees sprout. According to zhang langlang, his father used to discuss the way out of Chinese painting with li keran on the way to work every day. Finally, he decided to use xuan paper and brush to sketch from the scene, so as to dredge the blood relationship between art and nature. Zhang ding not only thought like this but also did it all the time. He began to sketch in the spring of 1954 with li keran and luo Ming in the south of the Yangtze river for nearly half a century. Whether Chinese painting is full of blood due to sketching is unknown, but I did see a vibrant due to sketching zhang ding. Especially after the founding of the People's Republic of China, zhang ding started sketching from 1954 (at the age of 37) to 2002 (at the age of 85). If it is reconnected, we can see its exploration process in the painting language, that is, from the view of the landscape to the mind of the landscape. In the early stage (1950-1960s), zhang ding's sketching was dominated by colored ink. During this period, the sketching ruler was not large, and there were a lot of contents showing the real life. Moreover, the painting was taken from a fixed perspective, or even from a close distance -- only a part of the object to be watched was used in the painting. In the later period (1970-1990s), zhang ding's sketches were mainly coke ink, most of which were seen in albums and long volumes, and many other sketches were written in pen or pencil. 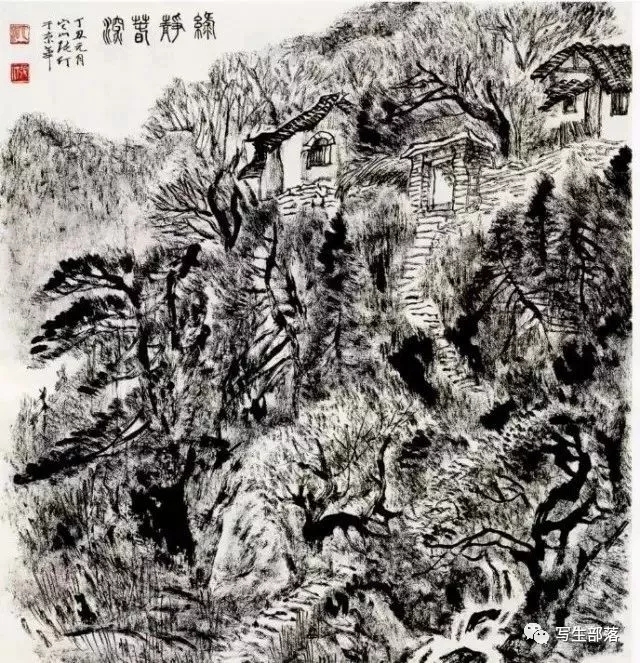 During this period, zhang ding created many large mountains and rivers, but sketching is not only a way to draft for the search of the most peculiar peaks. Zhang dingchang often marks this as "day class" and "morning class" on the inscriptions and postscript, which is intended to practice writing. In his later years, he even repainted the sketches of many years ago, which is called "picking up ancient relics" and is the memory of the journey of life. 1. Perspective: sketching is expanded from a fixed perspective to a mobile perspective, with a larger and larger scope. Zhang ding's self-statement is to collect and reconstruct the scenes in different directions in "holding the whip to drive the mountain". 2, light and shadow: zhang ding early sketch is landscape sketch type, and at this time on the screen a lot of light and shadow brush less. Generally speaking, the performance of light depends on the blank space of the picture, and the projection is directional. However, at this time, the light in the zhang ding picture has changed into scattered light along with the flow of space, and even the white space is no longer to express light, so there will no longer be shadows in a single direction. 3. Use of pen: during this period, the arrangement of dot, line and surface became more active and free, the picture became comfortable and the pen became simple, the line was no longer the outline of the object, but only the light and shade or transition of the object, and even a rare boneless painting method appeared. I felt that at this time, zhang ding's painting language seemed to be more and more close to another person. In the 1990s, zhang ding's light and shadow, which she used to be good at, appeared from time to time in her sketching. For example, in 1994, she sketched the ancient road of yu jin, which recorded the cold branches of the ancient temple being bathed by the warm sun at noon in winter. However, his painting language in this period is generally the summary and mastery of his previous sketching experience, which is the result of his maturity. The above changes of sketching show that zhang ding has been absorbing nourishment from two aspects: master nature and master predecessors. In 1954, zhang ding jiangnan bought huang binhong's mountain and water album before he wrote it, and paid a special visit to him in hangzhou. Zhang ding life only discussed two older than him painter, qi baishi and huang binhong. In 1958, zhang ding published an article "on qi and huang" in the magazine of fine arts. He praised the northern qi and the southern huang, and praised qi baishi for expressing the spirit of birds and the portrayal of insects. Huang binhong also praised the ancients, more division of nature, do is the addition of ink, and to achieve the ultimate. Although zhang ding is aligned, huang erren is excessive beautiful add, but actually right now he already made his choice. Zhang ding stepped down as an administrator in 1984, which finally enabled him to draw from nature in peace and study huang binhong's mountains and rivers album, which had been around for 30 years. Thus, his picture language also changed significantly. In 1989, zhang ding in shexian county, anhui province, the hometown of huang binhong, made a speech on comprehensively developing the study of huang binhong. Zhang ding claimed to be huang binhong's primary school student. In his later years, zhang ding "drew up" the works of huang binhong and ni zan, by which he learned from others and communicated with the ancients. Just as huang binhong approached ni zan through hongren bridge, zhang ding also connected the ancient and modern times through huang binhong bridge. Zhang ding, who was determined to be conserved, finally found the source of his life in both nature and tradition. These two sources intersect in his works, and show us what is called vigorous huazi and what is called high mountain and long river.